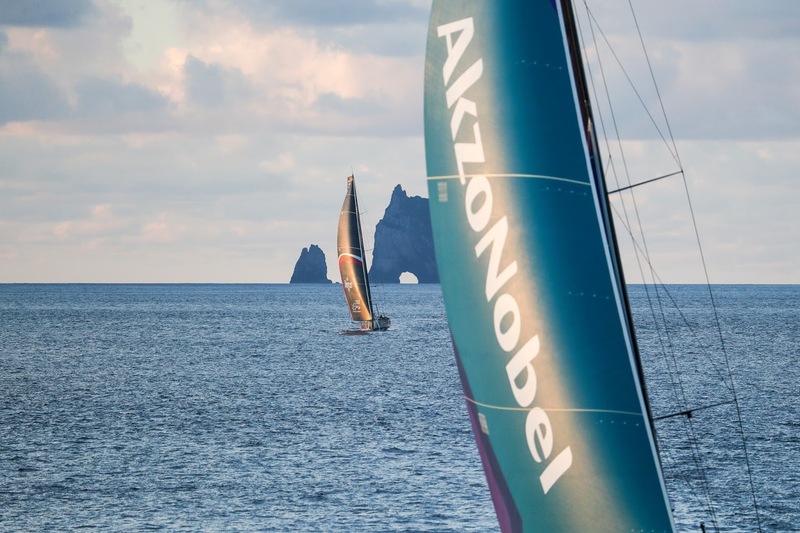 Team AkzoNobel has won Leg 6 of the Volvo Ocean Race, racing 6,344 miles from Hong Kong to Auckland in 20 days, 9 hours and 17 minutes and 26 seconds. It was a tremendous win, and came after an epic final 24 hours, when a ridge of high pressure off the north east coast of New Zealand stalled the progress of the leading boats, allowing those behind to close what had appeared to be an insurmountable gap. For team AkzoNobel and SHK/Scallywag, the buffer they’d built up over the past week was only just sufficient, and they were able to match race down the coast all the way to the finish line in the Waitematā Harbour, usually sailing within hailing distance of each other. In the end, the margin at the finish was just two minutes between first and second place. It’s the first leg win for team AkzoNobel and earns the team an important 8 points on the leaderboard, after fighting all the way to the finish with Scallywag. The second place finish in Leg 6, combined with a leg win into their home port of Hong Kong, has elevated SHK/Scallywag up to third place on the overall leaderboard. While the weather pattern of the last 24 hours has made for a heart-stopping finish for race fans, it also led to a heart-breaking result for Dee Caffari’s Turn the Tide on Plastic. Just 24 hours ago, Caffari and her team appeared poised to claim their first podium of the race, even while challenging for the leg win. MAPFRE and Dongfeng Race Team, first and second on the overall leaderboard, were over 60 miles behind Caffari. It would have made for a well-earned and popular result for an underdog team. But as the leading trio bumped up against an unavoidable patch of calm winds, MAPFRE and Dongfeng roared in, closing the gap down minute by minute. As darkness fell on Tuesday night and the wind picked up for the final 60-mile sprint to the finish, the two powerhouse red boats were within striking distance of Caffari and her team, just 2 miles back. And over the next 90 minutes, they were able to grind their way past, pushing Turn the Tide on Plastic back into fifth place with 20 miles to run. While Caffari and her crew showed incredible fighting spirit, clawing ahead of Dongfeng Race Team once again as the boats raced through the Hauraki Gulf on the final approach, they couldn’t hold on, and would need to settle for fifth place, behind both MAPFRE in third and Dongfeng in fourth. Overlooking the immediate disappointment of the day, this marks the best result of the race to date for Turn the Tide on Plastic and is a sign of progress for a young and improving team. Team Brunel remains on the race course, speeding towards the finish approximately 90 minutes behind their fellow competitors after falling victim to a bold tactical choice over the weekend that backfired and put them behind the rest of the fleet. Vestas 11th Hour Race did not sail in Leg 6 after being shipped to Auckland for repairs. The team has lost ground on the leaderboard, with both Scallywag and AkzoNobel overhauling them to hold down third and fourth place, with Vestas 11th Hour Racing sliding to fifth. The team is expected to release an update over the coming days.